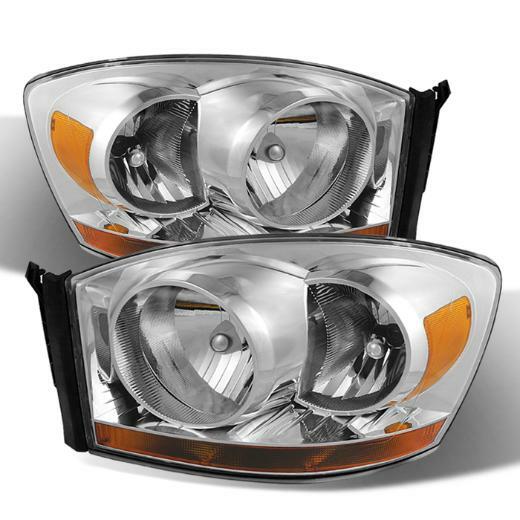 XTune Chrome Crystal Headlights 06-08 Dodge Ram XTune Chrome Crystal Headlights 06-08 Dodge Ram, XTune HD-JH-DRAM06-AM-C Headlight, 06-08 Dodge Ram Chrome Headlights, 06-08 Ram Chrome Headlights, 06-08 Ram Headlights, 06-08 Ram Chrome Headlights, Dodge Ram Headlights, Dodge Ram Chrome Headlights [XTune HD-JH-DRAM06-AM-C Lights] - $168.95 : 3rd Strike Performance, Your Source for Late Model MOPAR Performance Parts and Accessories! The Xtune Group has been serving the auto industry for nearly a decade. We specialize in wholesale distribution of automotive products. We are the leading providers of aftermarket lighting, tuning and styling auto parts in the U.S. Our 140,000 square foot corporate headquarters is located in the City of Industry, California. The quality lighting products offered by Xtune are compliant with all applicable federal regulations. Unless otherwise noted, all products are D.O.T. Compliant and satisfy Federal Motor Vehicle Safety Standards (FMVSS) code no. 108 and are not only ISO-9000 certified but also ISO-9002 certified as well. As further proof of regulation compliance, our products are also approved by the Society of Automotive Engineers (SAE). State and local laws may vary.